"Richmond upon Thames" redirects here. For the town, see Richmond, London. 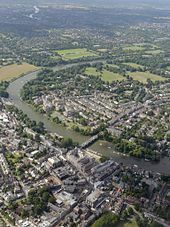 The London Borough of Richmond upon Thames ( pronunciation (help·info)) in south-west London, England, forms part of Outer London and is the only London borough on both sides of the River Thames. It was created in 1965 when three smaller council areas amalgamated under the London Government Act 1963. It is governed by Richmond upon Thames London Borough Council and is divided into nineteen wards. The borough is home to the National Physical Laboratory and The National Archives. The attractions of Kew Gardens, Hampton Court Palace, Twickenham Stadium and the WWT London Wetlands Centre are within its boundaries and draw domestic and international tourism. 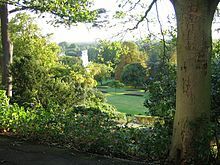 The borough is approximately half parkland – large areas of London's open space fall within its boundaries, including Richmond Park, Kew Gardens, Bushy Park and Old Deer Park. The predominant other land use is residential. Most businesses within the borough consist of retail, property improvement/development and professional services. Parts of the borough, including Barnes, Richmond, St Margarets, Cambridge Park and Marble Hill, some areas of Twickenham and much of East Sheen rival Stanmore Hill and Kenley as the highest house-price districts and neighbourhoods in Outer London. In 2006, research commissioned by a major mortgage lender found that, on the quantitative statistical indices used, the borough had the best quality of life in London and was in the top quarter of local authorities nationwide. A neighbouring authority in Surrey achieved the best quality of life in that report. Demography is a diverse picture as in all of London: each district should be looked at separately and even those do not reflect all neighbourhoods. Whatever generalisations are used, "the fine-grained texture of London poverty" by its minutely localised geography must always be taken into account according to an influential poverty report of 2010. Richmond upon Thames has the lowest child poverty rates in London at 20% and contains at least one ward with an above-average level (for London) of working-age adults receiving out-of-work benefits but even this borough – reflecting the best result – has two standard poverty indices of sixteen in which it is placed in the worst quarter of boroughs. Richmond is one of London's wealthiest boroughs on many measures. It has the lowest rates of poverty, child poverty, low pay, child obesity and adults without level 3 qualifications of any London borough, according to a 2017 research project by Trust for London. London's German business and expatriate community is centred on this borough, which houses the German School London (DSL) and most of the capital's German expatriates. The Local Authority divides the borough into fourteen loosely bounded neighbourhoods, or "villages", with which residents broadly identify. Some of the neighbourhoods have the same name as their associated political ward, but the boundaries aren't officially aligned. There is also no direct alignment between these areas and postcode districts, which tend to cover much broader areas, crossing the borough boundaries. Although most addresses in the borough have TW postcodes, some have SW and KT postcodes. Parks take up a great deal of the borough and include Richmond Park, Bushy Park, Kew Gardens, and Hampton Court Park. There are over 100 parks and open spaces in Richmond upon Thames and 21 miles (34 km) of river frontage. 140 hectares within the borough are designated as part of the Metropolitan Green Belt. The borough is home to the National Physical Laboratory and the attractions of Hampton Court Palace, Twickenham Stadium and the WWT London Wetlands Centre that draw domestic and international tourism. The river Thames becomes narrower than at any part of Inner London towards its flow into the borough and becomes non-tidal at Teddington Lock in the borough; its main axis runs south to north, rather than west to east through more than half of the borough. The borough was formed in 1965 by the merger of the Municipal Borough of Twickenham from Middlesex with the Municipal Borough of Richmond and the Municipal Borough of Barnes from Surrey; the new council's offices were centred at York House in Twickenham. The name "Richmond upon Thames" was coined at that time; it is now commonly but inaccurately used to refer to Richmond only. The borough's history is reflected in the coat of arms, which was officially granted on 7 May 1966. It is: Ermine a portcullis or within a bordure gules charged with eight fleurs-de-lis or. The crest is: On a wreath argent and gules out of a mural crown gules a swan rousant argent in beak a branch of climbing red roses leaved and entwined about the neck proper. The supporters are: On either side a griffin gules, armed and beaked azure, each supporting an oar proper, the blade of the dexter dark blue and that of the sinister light blue. The portcullis was taken from the arms of the Municipal Borough of Richmond; the swan crest, from the arms of the Municipal Borough of Twickenham; and the griffin supporters and shield from the arms of the Municipal Borough of Barnes. Red, gold and ermine are the royal livery colours, reflecting Richmond's royal history. The swan represents the River Thames, which flows through the borough. The oars are from the Oxford University Boat Club and the Cambridge University Boat Club, reflecting the fact that the Boat Race between the two universities ends at Mortlake in the borough. Since its formation, the council has most often been led either by the Conservatives or by the Liberal Democrats. Currently, the Lib Dems make up the majority in the council. London Heathrow Airport is located a few kilometres west. The borough is served by many Transport for London bus routes. The borough is connected to central London and Reading by the National Rail services of the South Western Railway. The London Underground's District line serves Richmond and Kew Gardens stations: both are also served by London Overground trains on the North London line. The other stations are: Barnes; Barnes Bridge; Fulwell; Hampton; Hampton Wick; Mortlake; North Sheen; St Margarets; Strawberry Hill; Teddington; Twickenham and Whitton. Richmond upon Thames is the local education authority for the borough. The borough has a non-League football club, Hampton & Richmond Borough F.C., who play at Beveree Stadium in Hampton. The Twickenham Stadium hosts rugby internationals and the Twickenham Stoop is home to the Harlequins Rugby Team. Richmond Rugby Club are also active and share their grounds with London Scottish F.C. The Richmond Minis is a large youth rugby organisation whilst the Richmond Heavies organise games for more veteran players. The Twickenham Museum is a volunteer-run museum opposite St Mary's parish church. The Museum of Richmond, in Richmond's Old Town Hall, close to Richmond Bridge, has displays relating to the history of Richmond, Ham, Petersham and Kew. Its rotating exhibitions, education activities and a programme of events cover the whole of the modern borough. The museum's highlights include 16th-century glass from Richmond Palace and a painting, The Terrace and View from Richmond Hill, Surrey by Dutch draughtsman and painter Leonard Knyff (1650–1722), which is part of the Richmond upon Thames Borough Art Collection. Orleans House Gallery in Twickenham displays material from the London Borough of Richmond upon Thames' art collection. This includes a portrait of James Johnston by Thomas Gibson, paintings of Orleans House by Arthur Vickers and several other artists, and the Burton Collection, which includes artwork, personal effects and photographs of the explorer Richard Francis Burton. The gallery is also the site of the London Borough of Richmond upon Thames' arts service and provides educational workshops for a wide variety of ages, using the converted stables and coach house as educational spaces. Garrick's Temple to Shakespeare in Hampton hosts a free Sunday afternoon Shakespeare exhibition from April to October and a series of summer drama, music and exhibitions. Close to Richmond railway station is the Orange Tree Theatre which was founded in 1971 in a room above the Orange Tree pub. As audience numbers increased there was pressure to find a more accommodating space and, in 1991, the company moved to current premises within a converted primary school. The 172-seat theatre was built specifically as a theatre in the round. It has acquired a national reputation for the quality of its work for staging new plays, and for discovering undeservedly forgotten old plays and neglected classics. The Cabbage Patch pub on London Road near Twickenham railway station has, since 1983, been a regular venue for live music on Sunday nights, organised by TwickFolk. ^ "Richmond upon Thames Ward Boundaries". Google Maps. Retrieved 6 December 2018. ^ Womack, Sarah (12 August 2006). "Report on the quality of life around Britain". The Daily Telegraph. Retrieved 9 March 2014. ^ "Child poverty in London - key facts | Child Poverty Action Group". www.cpag.org.uk. Retrieved 24 August 2016. ^ "London's Poverty Profile". Trust for London. Retrieved 7 June 2018. ^ Moore, Fiona. "The German School in London, UK: Fostering the Next Generation of National Cosmopolitans?" (Chapter 4). In: Coles, Anne and Anne-Meike Fechter. Gender and Family Among Transnational Professionals (Routledge International Studies of Women and Place). Routledge, 6 August 2012. ISBN 1134156200; ISBN 9781134156207. ^ "Village Plans". London Borough of Richmond upon Thames. Retrieved 6 December 2018. ^ a b "Village Planning explained". London Borough of Richmond upon Thames. Retrieved 6 December 2018. ^ "Postcodes in Richmond upon Thames". Doogal. Retrieved 6 December 2018. ^ "Richmond: Total Population". A Vision of Britain Through Time. Great Britain Historical GIS Project. Retrieved 6 September 2011. ^ "Richmond upon Thames". Heraldry of the World. Retrieved 26 June 2014. ^ "The Terrace and View from Richmond Hill, Surrey". Art UK. Retrieved 13 April 2016. ^ "Orleans House Gallery". Art UK. Retrieved 30 September 2016. ^ "Art and Literacy at Orleans House Gallery". News. Orleans Park School. 2015. Retrieved 11 August 2015. ^ "History". Orange Tree Theatre. Retrieved 30 September 2016. ^ Webb, Jela (2008). "TwickFolk: Music for the Folks!". Maverick. Retrieved 4 September 2016. ^ "Club Of The Month:TwickFolk". FATEA magazine. Retrieved 24 August 2011. ^ "British towns twinned with French towns". Complete France. Archant Community Media Ltd. Retrieved 4 July 2016. ^ a b c "Twinning". VisitRichmond, London Borough of Richmond upon Thames. Retrieved 14 September 2013. This page was last edited on 12 April 2019, at 18:23 (UTC).